Peach season is upon us once again! Like last year, it is about three weeks early and has caught me off guard, which it shouldn't have, but, well there you go! I was planning on canning about 200 pounds of peaches this year, but I just might settle for 120. That many I can handle on my own. Here is how I do my peaches! I dig out all my jars and sort them according to size. I use quart size jars for peaches. Check the rims for nicks and the jar body for cracks. I rinse them and put them through a wash cycle on my dishwasher before moving them into a 200 degree F oven to keep warm. I make sure that I have a small bowl, a kitchen knife and a lot of clean towels and pot holders ready. I put a folded sheet on a table. This year it will be a couple of card tables, since we do not have a dining table. I also have ready the canning tongs to put the jars in and out of the canner. Lids and screw-on bands are ready as well. I make a thin syrup. I like to use as little sugar as possible. I have included the recipes for syrups below. I use the large mouth funnel and fill each jar to the neck, then I add the hot syrup, using the kitchen knife to remove any air bubbles. Wipe the rim with a damp dishcloth before fitting the metal lid (these should have been sitting in a dish of boiling water to sterilize) and add the screwband. Tighten the lid and place in the canner rack. When the rack is full, lift carefully into a canner of boiling water. When the water in the canner returns to a boil, set a timer for 20 minutes. Remove carefully from the canner and sit on a towel (or in my case, a sheet) on a table. Make sure there are no cool drafts as the cool air can cause the jars to break. As the contents of the jar cool, you will hear a ping as the lids seal to the jars. There is not a more satisfying sound than hearing the pings as those jars seal! When the jars have sealed and cooled down, you can remove the screwbands and reuse them on other jars. 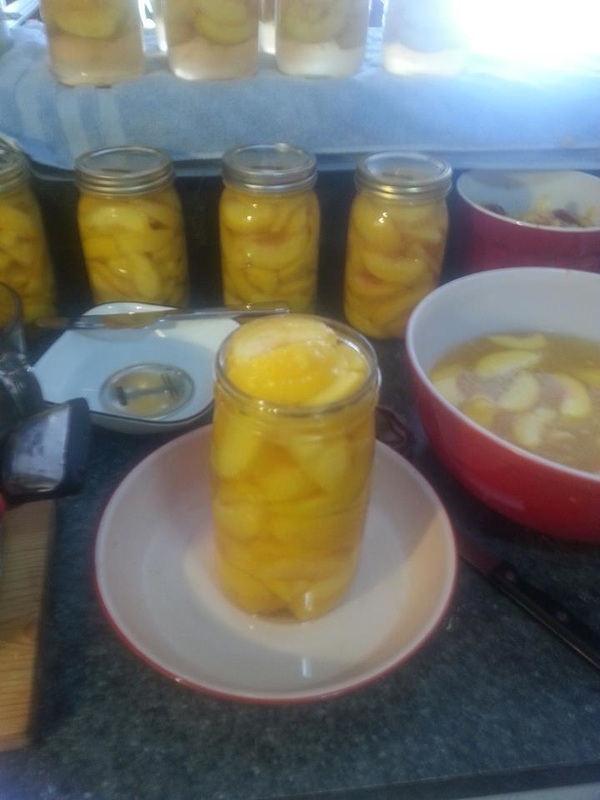 Canning peaches is easy peasy....it's just time consuming, but oh, so worth it all!! Boil sugar and water together for 5 minutes.